Annotation: Having always been best friends, Nina's place in the world is thrown for a loop when she comes back from summer vacation filled with great stories about her new boyfriend and discovers that Avery and Mel have become romantically involved--making her wonder if she has a place in their once special trio. Reprint. Nina, Avery, and Mel have been best girlfriends forever. The summer before their senior year, Nina experiences first love at an academic summer program, while Mel and Avery explore their romantic feelings for each other. The book delicately and realistically presents the complexities of friendship and young love, with a minimum of sentimentality. Copyright 2005 Horn Book Guide Reviews. [Page 65]. Copyright 2006 Reed Business Information. Johnson (The Key to the Golden Firebird) offers a saga of three best friends in Saratoga Springs, N.Y.: impetuous, wry Avery, shy, sweet Mel and bright, assertive Nina (whose last name gives the novel its title). During the summer before their senior year, Nina heads cross-country to attend a summer program on Stanford's campus, while her two pals waitress at a local restaurant. One morning after Avery has spent the night at Mel's house, the two share a kiss on the lips. Some readers will find the descriptions of the duo's involvement overwrought or trite (e.g., "Everything was tiny and well disguised, but there were little electric moments everywhere" and "Avery's lips were always slightly smoky, as was the upholstery of her car"). In a scenario totally lacking in subtlety, Nina (just back from her program, at which she fell madly in love with a male student) walks in on Avery and Mel while they are kissing in a store dressing room. Curiously, the novel's most sympathetic character is a supporting player, Parker, a funny and deep-feeling fellow who aspires-futilely-to date both Mel and Nina. Though the novel becomes more credible as it unfolds, for some readers, Johnson's tale may tread too close to soap opera turf, with its attendant stalled pace. Ages 14-up. (Oct.) Copyright 2004 Reed Business Information. 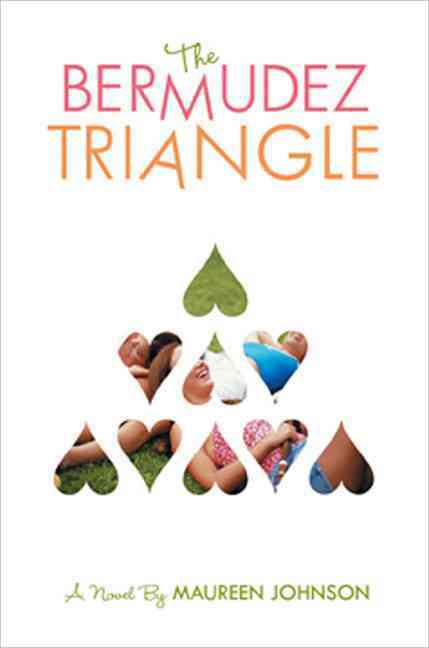 Gr 9 Up-Johnson begins this exceptional novel in a lightweight fashion but quickly segues into more serious issues that affect the three young women who make up the Bermudez Triangle. It is the summer before their senior year in Saratoga Springs, NY. At first, organized, serious Nina has trouble adjusting to her leadership workshop at Stanford University. Although she desperately misses Avery and Mel, who are waitresses at a restaurant back home, she quickly falls head over heels for eco-warrior Steve, who has grown up in a commune on the West Coast-so different from Nina's secure middle-class experience. When she returns to New York, she immediately senses that Mel and Avery are keeping secrets and soon discovers that they have become lovers. Rocked to the core, Nina wishes them happiness, but feels excluded and lonely, especially as her long-distance relationship begins to deteriorate. As is typical for teens, the girls obsess ad nauseam over their romantic relationships. Yet this narrow focus lends authenticity to the narrative, and readers become drawn into the characters' lives as they stumble toward adulthood, fall in and out of love, enlarge their circle of friends, and rethink their values. As the story deepens, Johnson does a superb job of subtly developing individual personalities for each one. Although all ends well, it's a long, hard struggle, one that perceptively reflects the real-life ambiguities and shades of gray faced by contemporary adolescents.-Susan Riley, Mount Kisco Public Library, NY Copyright 2004 Reed Business Information.